Evangelical Outpost has recently written on the role of networking in the blogging world. In support of the value of networking, Evangelical Outpost notes that the TTLB ecosystem ranks bloggers not by traffic alone but primarily be inbound links. The reason for the emphasis in links in the TTLB rankings is that the power of an organization's influence is more proportional to its networking structure than its immediate size. 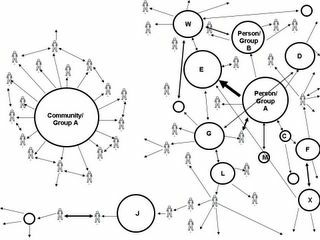 Don't get me wrong, the goal of a network is influence, and a organization can be simultaneously big and structured as a power network, BUT the more vital and sustaining characteristic of an influencial community is the power of its affinity network. The blogging community is ranked by in-bound links because of the fact that the long term potential for a person or institution to have cultural influence is tied to the structure of its network. This principle is depicted in the daigram below. 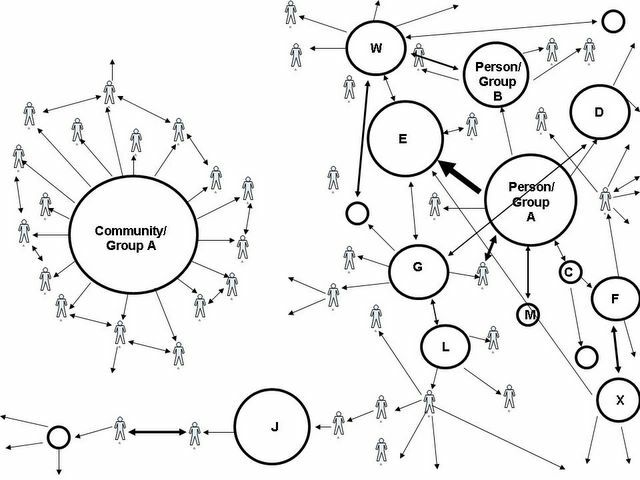 In this diagram, the community on the left depicts a ghetto community, and the community on the right is a developing power network. In the diagram above, the ministry of the group on the left appears bigger at first glance. Assuming these communities are chuches, the communty leader on the left actually has a far bigger church and connects to more individuals on a given Sunday, but the community on the left is structured as a Christian Ghetto. In contrast, the ministry or community on the right is a growing power network. Which community is actually more influential? Whose ministry will continue after the original leader is gone? Who is mentoring in the pattern of Jesus? Jesus empowered leaders, and, in so doing, Jesus built and modeled for us community-building in the pattern of the power network. Another good illustration of this phenomenon in the Bible is the role of the “scattering” of the church in Acts 8. In order to prevent the possible insulation of the church into a Christian ghetto, scattering happens. Because Jesus had trained up trustworthy leaders, and the Apostles likewise continued the mentoring model of Jesus, the scattering didn’t kill the church. Instead, the scattering of the church led to explosive growth. The Apostles stayed in Jerusalem, and their immediate community invariably shrunk. Even so, because of the number of semi-autonomous and empowered leaders in the community at large, the church and the Apostles influence actually grew mightily. The rest is history!!! Which type of community is your church? Are you insulated from other groups and cut off from the other institutions in the culture at large? Are there ever growing cultural barriers between your Christian community and the world around you, or are you part of a developing power network? Is your Christian community filled with many ministries of many flavors? Are these ministries discipleship and proclamation hubs in their own right? Is the structure of the body non-hierarchical and fluid? If the pastor fell or died, are there many other leaders in the community that can continue the mission? As leaders, do we promote a loose affiliation of growing leaders or does our desire to have everything "just perfect" end up cultivating an insulated community? This new paradigm is not so new is it!!! The biblical model of leadeship is actually that of mentoring and the development of a fluid, multi-cultural power network! This illustration is another example of what I mean by the biblical model of discipleship. The power of mentoring in the footsteps of Jesus will lead the church into the multiplying influence of the power network.